With the beach just footsteps away, Pelican's Landing is situated on Myrtle Beach’s acclaimed Shore Drive, and is a great place to have a family-friendly vacation or romantic getaway. Welcome to this bright and beautiful second-floor three-bedroom oceanside condo offering comfortable furnishings and convenient beach and pool access. This condos vibrant colors and classic beach inspired decor help you to relax and enjoy your time at the beach. This condo sleeps eight people with one queen bed, one full bed, two twin beds and one queen-sized sleeper sofa. 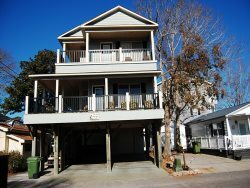 Additional features include a washer/dryer, slight oceanview from master bedroom balcony, three TV's, one VCR, one DVD . Limit two parking spaces per unit This unit just renovated in January 2013.